Can America’s small cities be saved? I spent quarter of a century managing programs to address this question. And I am probably just one of thousands of practioners in the fields of historic preservation, parks and recreation, and community development across the country who have tried to tackle this problem. In Pennsylvania, my home state, small cities are poster children for economic distress. Over 30 municipalities, almost all of which could be characterized as small cities, have been designated financially distressed under Act 47 a state law passed in 1987 that was designed to provide failing municipalities with some relief. All across the commonwealth those small cities not yet designated under Act 47 were and are teetering on the edge. All of them had a similar litany of problems declining population and tax revenue, high pension and health care costs, a large inventory of blighted or tax-exempt properties, and heavy burden of municipal debt. Once upon a time I administered programs that provided advice and assistance to preserve historic buildings, to revitalize main streets, to revamp park systems, and reimagine former canals and railroad beds as recreational assets. While there were some successes, even an enthusiastic supporter as myself could see that these initiatives and all the good intentions in the world were not going to turn these places around. Now I have been out of this line of work for quite a few years. However, I felt my past frustration and despair rush back when within the space of three days, I was confronted by two opinion pieces concluding that many small cities are probably doomed. Paul Krugman writing in the New York Times (December 30, 2017), posits that while once these places had a clear rationale for being as service centers for the surrounding countryside and later adding on whatever industrial enterprises came along, this is no longer a winning strategy. The modern economic supply chain, one that is cut lose from the landscape as well as the pressures of globalization will inexorable erode the viability of small urban centers. See The Gamblers Ruin of Small Towns . Well I thought – I do not hear a great debate going on in Pennsylvania although it would be great, if it were happening. As of now I have not seen the issue receive increased political attention. But if it was to receive attention, there is still no consensus about what strategies might revive small towns and cities or even if it is possible at all. Some economists have concluded that the best solution is for populations to move to where the jobs are located. But according to the census data that is not happening. The American people are moving at about half the rate that they did in the 1970s and ’80s. Why are people opting to stay put? Heather Long’s article suggests that one reason may be risk aversion to moving to another place that might also have an uncertain future and face the same problems. Even more importantly, people may have have the rational desire to stick with the trusted and familiar. A local support system of friends and family has real value that will be lost upon relocation. So if residents want to stay put and it is unlikely that many of these places are going to completely close down, then what? Again there are no good answers. A recent report by the Pittsburgh Foundation found that Pennsylvania communities in the state’s Act 47 distressed municipalities program generally performed worse than average despite state assistance that in some cases has stretched for decades. Other programs like Main Street designations and other targeted grant assistance are just not game changers. And if indeed the problems are caused by global shifts in the national economy, local economies are not likely to respond to such small interventions. Heather Long is hopeful that the social capital of people and place will serve as the “Magic Fairy Dust” to help build a better future. I hope so too, but experience has lead me to believe it will just extend the long goodbye. There is a lot of talk about how the creative economy – sometimes synonymous with the young, hip and artisanal – is helping to revitalize urban centers. Brooklyn is of course ground zero, but it is happening in large and small cities across the nation. The historic preservation community has certainly made the link. An upcoming symposium in New York City The Accidental Preservationist: Artists, Artisans, Outliers & the Future of Historic Preservation – sponsored by the James Marston Fitch Charitable Foundation on the occasion of its 25th anniversary – will be exploring the influence of non-traditional practitioners of historic preservation on architectural revitalization of cities. But what about our rural landscapes? Can these ideas catch fire and help revitalize struggling communities far away from big city hipness and density? 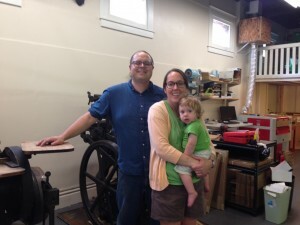 Joe and Andrea Lanich, who just opened their letterpress shop, may be on the leading edge of this trend for rural America. 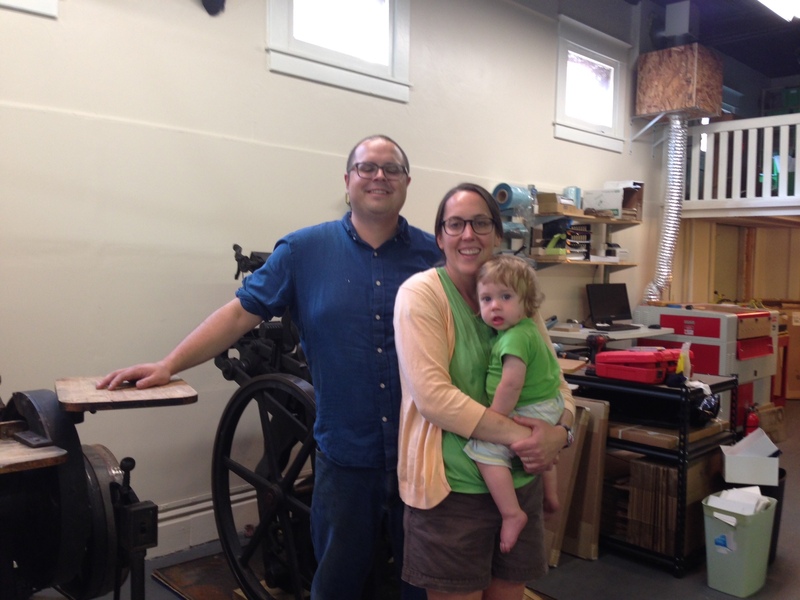 An engineer and architect, by training, they began their business, Laughing Owl Press, as a hobby in their garage. Needing more space for expanding production and the large Chandler & Price presses that Joe has adopted and reconditioned, they relocated to the main street of Kane, Pennsylvania. 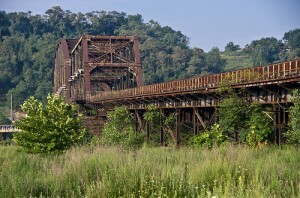 This small borough in the Northwest corner of the state is surrounded on three sides by the Allegheny National Forest. It was once known as the Black Cherry Capital of the World (as in trees not soda). The town’s economy had been based on timbering and manufacturing, but for decades Kane and the surrounding region have struggled. External forces like globalization have caused a decrease in jobs followed by high unemployment rates and population loss with the sharpest decline in the numbers of younger, working-age residents. To counteract some of the regions economic problems, Pennsylvania’s state governments launched the PA Wilds in 2003. The initiative was centered on a rural 12 county region that includes Kane and is known for its heritage of public lands and small historic communities. The region had 2 million acres of protected land including 29 state parks, 8 state forests, and the Allegheny National Forest. The PA Wilds strategy included a new brand name, promotional campaigns, a major investment in public recreational facilities, and a stated commitment to do so in a way that valued the stewardship of natural resources. It is considered one of the most ambitious of the emerging conservation landscape initiatives in the United States. Initially the PA Wilds focused on outdoor tourism. After all the region’s parks and forests add up to one of the largest block of public land on the east coast equivalent in size to Yellowstone National Park. The concept was to expand the recreational amenities on these lands, which will increase visitation and lead to economic revitalization. However, community redevelopment especially on a landscape scale is more complex than just heads in beds. And that is why the work of Ta Brant is so important. As the executive director of the PA Wilds Center for Entrepreneurship, her job is to diversify the regional economy by building on local products and industries. For example, the PA Wild Artisan Trail helps marry the PA Wilds brand with the locally made movement. The program markets juried handcrafted items made in the PA Wilds, provides an online presence, and links artisans with sales outlets in the region. The program has expanded from artists and craftsmen to include craft winemakers and distillers. Brant sees local food products as an exciting future branding opportunity. 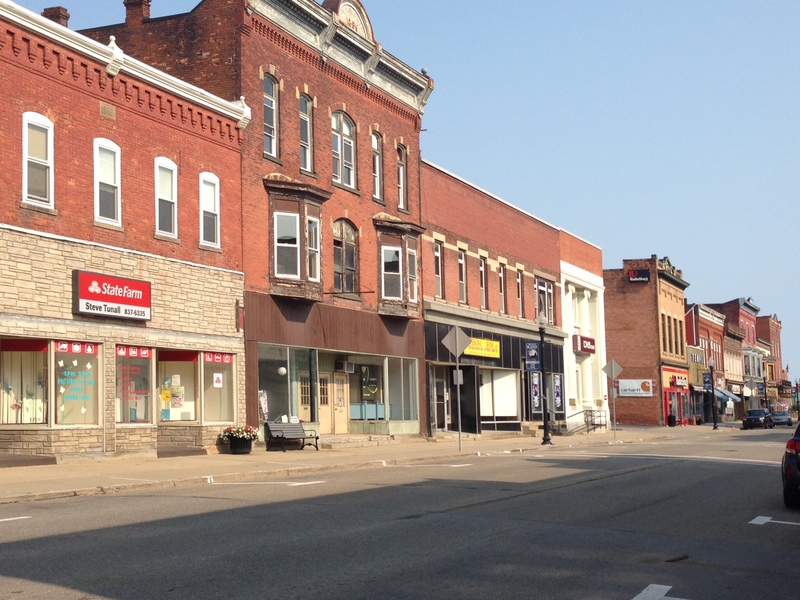 Creating this more complex local economy is critical to the future of small towns like Kane. The customer base for Joe and Andrea Lanich’s print shop come from around the world. But it is the people and potential of the community that attracted the couple to the town’s Main Street – a welcoming chamber of commerce, the Kane Historic Preservation Society, who sponsor an art galley and events in the historic train depot and other new creative economy businesses in Kane, for example the just launched distillery C& J Spirits. The PA Wilds is hoping to build a network using culture and nature to create sustainable communities in the forest. It is not everyday that our state courts ponder the lessons of history. But this is exactly what the Pennsylvania Supreme Court did this December (2013) when it issued its opinion on the constitutionality of Act 13. Enacted by the legislature in 2012, the act extensively revised the Commonwealth’s Oil and Gas Act to accommodate the new boom in natural gas drilling. Among other things the amended legislation required that industrial oil and gas operations be permitted as a “use of right” in every zoning district in the state. It also adopted new setback requirements to protect waterways, but provided a waiver process that was un-appealable by residents or local governments. Stating that drilling in the Marcellus Shale formation does violence to the landscape of the state, the court went on to consider various constitutional challenges to Act 13. Some of the most powerful parts of the decision delve into the Commonwealth’s Environmental Rights Amendment (See above). In announcing the judgment of the court, Chief Justice Ronald Castille noted that to date the state’s environmental rights jurisprudence is not well developed. This decision helps remedy this deficiency. The Chief Justice began by laying the following foundation. The opinion also proffers a sweeping statement about the scope of the environmental values considered by the amendment. This is a long and complex decision with multiple appellees and cross appellants. It deserves and I am sure will receive expert legal analysis – not just a few selective quotations. However, is it is invigorating to read an opinion that provides a historical context for the state’s Environmental Rights Amendment and makes such a sweeping statement of the landscape scale nature of amendment’s constitutionally protected values. As Pennsylvania confronts the next massive wave of resource extraction – natural gas drilling, its citizens now have a primer on the lessons from their past as well as some strong language on the commonwealth’s duty to conserve these values for the present and the future. The forests may not be primordial, but they have returned and are beautiful nonetheless; the mountains and valleys remain; the riverways remain, too, not as pure as when William Penn first laid eyes upon his colonial charter, but cleaner and better than they were in a relatively recent past, when the citizenry was less attuned to the environmental effects of the exploitation of subsurface natural resources. But, the landscape bears visible scars, too, as reminders of the past efforts of man to exploit Pennsylvania’s natural assets. 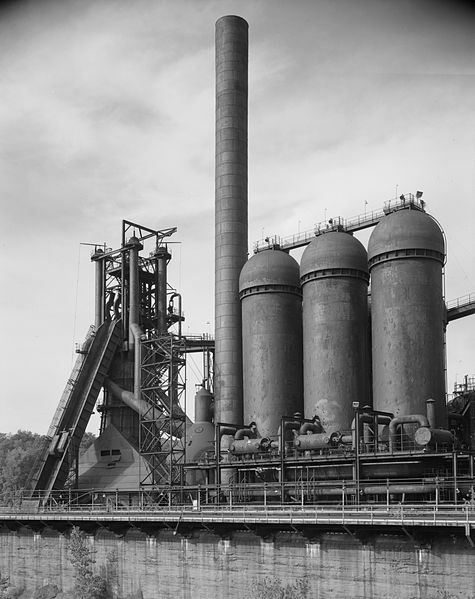 Pennsylvania’s past is the necessary prologue here: the reserved rights, and the concomitant duties and constraints, embraced by the Environmental Rights Amendment, are a product of our unique history. I like to think that once upon a time our cemeteries were inviolate landscapes cared for by the communities who created them. They did not have to be not classified as historic preservation projects or land conservation initiatives or tourism opportunities. But I have learned that many burial sites fall between the cracks of all such efforts both incremental and intentional. Rural cemeteries are abandoned as populations shift and families move on to new opportunities. Urban cemeteries fall victim to changing land use and financial downturns. 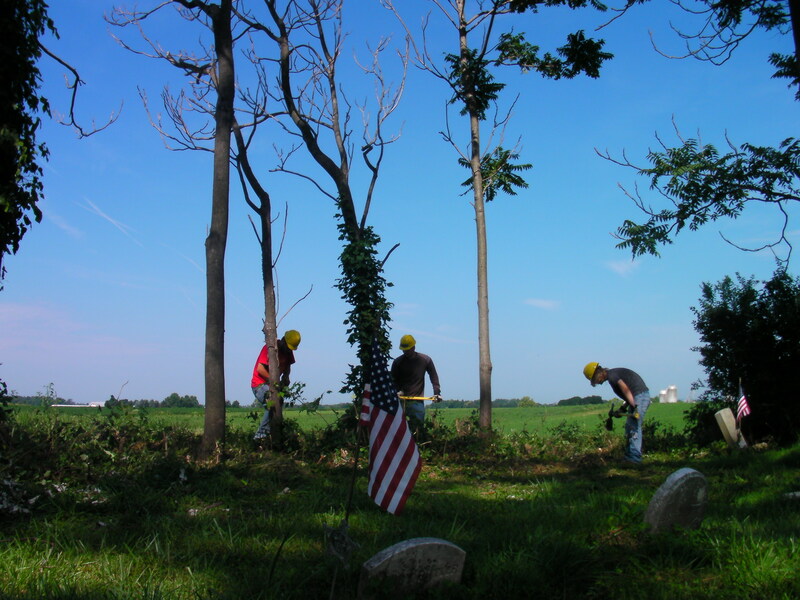 African-American cemeteries are particularly vulnerable. Recent experiences in the Commonwealth of Pennsylvania illustrate the challenges. In the run up to the 150th Anniversary of the Battle Of Gettysburg, Lenwood Sloan, then Director of Heritage and Cultural Tourism, kicked off a series of innovative projects to tell a more inclusive story of the state’s Civil War history. The work started by conserving and researching the 97 United States Colored Troops (USCT) military muster rolls that were located in the Pennsylvania Archives. 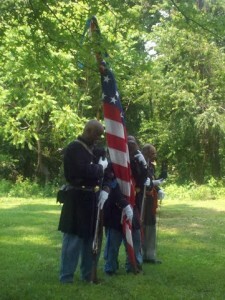 Of the eight thousand USCT who served in Pennsylvania regiments, the muster rolls documented those who survived. The tourism office then selected 100 African American Civil War veterans who were from Pennsylvania for further research and interpretation. The research tracked down and documented forty-two cemeteries across the commonwealth where USCT veterans were interred. This is where the story of the Pennsylvania (PA) Hallowed Ground begins. In seeking out these cemeteries, the tourism office found that some had become overgrown and forgotten; others were being cared for by stewards who were growing older and were seeking the next generation of caretakers. In an effort to help, the office sent out teams to assess the conditions of the burial sites and began to link the community of caretakers. They offered genealogical workshops and specialty tours and voluntourism programs. However, just as the program began to pick up steam a change in the Governor’s office in 2010 brought changes to the tourism office’s priorities. The state’s Visit PA web site still list some of these sites like the Lincoln Cemetery in Penbrook near the State’s Capitol of Harrisburg as places to visit. But today, there is no state program to help coordinate visitation or support the site’s caretakers. Many of the web links are now just dead ends. But for the cemetery caretakers the work goes on. Leaders such Barbara Barksdale at the Midland Cemetery in Steelton continues her over two decades of regular site maintenance with helpers as disparate as the work release crew from the county prison to the wrestling team at a local college. 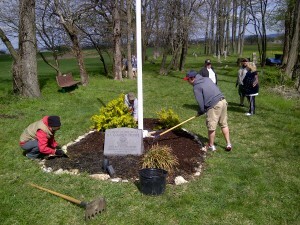 The VFW Post in Mechanicsburg still holds work parties at the Lincoln Colored Cemetery in a farm field in Lower Allen Township. 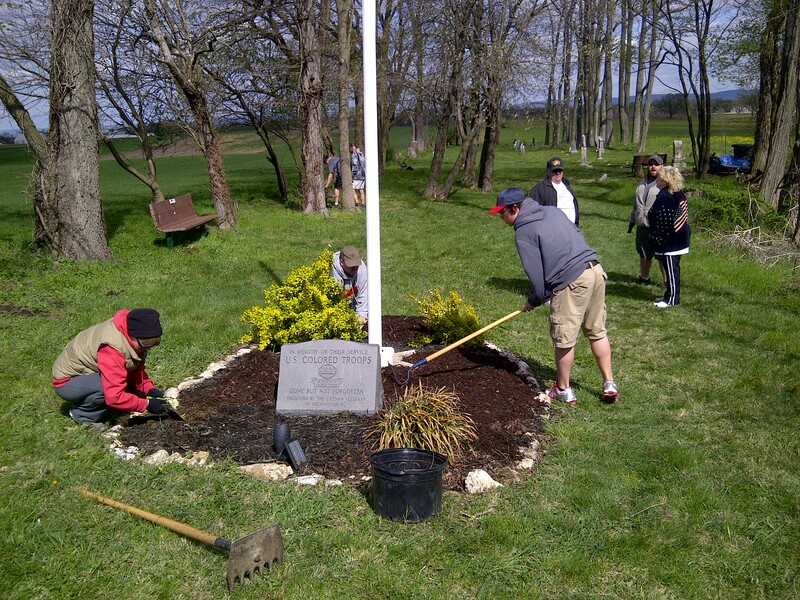 The local United Way’s provides volunteers for cemtery clean ups through the annual Day of Caring. Recently a small group of volunteers, who have dubbed themselves the PA Hallowed Ground project, have received a modest grant from the National Trust for Historic Preservation for an annual gathering for the caretakers and a few hands on workshops. They continue to seek opportunities to keep the community together. There is so much still to learn from PA’s Hallowed Ground. The fact that the USCT veterans were laid to rest in segregated burial grounds in the state where they served, that such cemeteries were often unincorporated places where even today ownership is unclear, that there are veterans from many conflicts honored at these sites, and that there are still places to discover and protect. However, the most important lesson is this – dedicated and caring people are still hard at work tending some of the nation’s most sacred places. And doing so, as Lenwood Sloane says “with their hands in the earth and their hands on their hearts’. Despite all odds this is a landscapes of hope. Funding Conservation: Is this the End of a Legacy? In these tough financial times, state and federal governments are all scrambling to balance their budgets. This has placed environmental and natural resource programs at risk in part because of past decisions to set up special funding streams for our publicly owned resources. Today, dollars that were once dedicated to state and local parks, open space conservation, and recreational infrastructure have been redirected to other uses. What in the past would have been called wise use of funds has now become a tempting target for appropriators and politicians looking for quick solutions to financial shortfalls. Pennsylvania, my home state, is no exception. Claiming fiscal necessity, recent governors both Democrat and Republican have raided the state’s Oil and Gas Lease Fund, reduced operating support to state parks, and proposed eliminating funding for the Keystone Recreation, Park and Conservation Fund. The Pennsylvania legislature also has used budget maneuvers to redistribute conservation dollars to fund other programs. In less than five years, over fifty years of conservation minded laws have been tossed aside or threatened with extinction. Conservation and environmental advocates have pushed back against these funding cuts with some success. However, fiscal projections for continued state revenue shortfalls are still looming on the horizon. Our contemporary political rhetoric depicts government spending as profligate and popular opinion is running against taxes or anything perceived as taxes. Funding for parks, open space, and conservation projects is painted as a luxury that the people cannot afford or even as a drain on the state coffers. So are we really mortgaging our children’s future to pay the bill for natural resource conservation? A little Pennsylvania history might be in order to better understand the how conservation funding programs of today originated as a strategy for the thrifty and sustainable management of public resources. There is a way to balance the books in favor of conservation and preserve our rich natural heritage. It is found in the wisdom of a man who would be 100 years old this month, Maurice K. Goddard. From 1955 to 1979In an unprecedented bipartisan career, he served five Pennsylvania governors. Through his good work, he left the Pennsylvania of today with an unparalleled legacy: 2.2 million acres of certified sustainably managed forests, 120 award-winning state parks, and the dedicated funding to help pay for them. 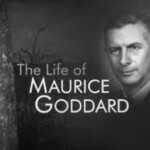 Perhaps it was Maurice Goddard’s training as a forester with its emphasis on sustainable management and multiple uses of public land that that led to one of his most innovative ideas for conservation funding, the Oil and Gas Lease Fund Act. 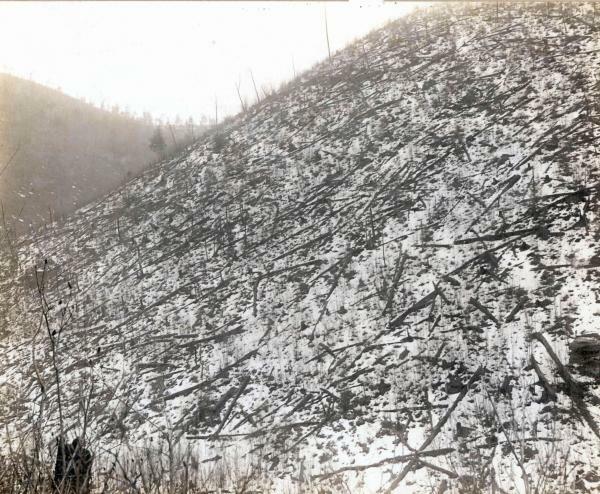 Prior to 1955, natural gas revenues from drilling on the state’s public forestlands were deposited in the general fund. Goddard gained bipartisan support for legislation to dedicate these rents and royalties to his department to be used solely “for conservation, recreation, dams, or flood control.” It was a great success. In the Goddard era and for years afterwards, almost all of the money was used to fund his vision of a state park within 25 miles of every Pennsylvanian and a professionally managed system of state forests. Goddard had found a way to pay for conservation by investing the money generated by the depletion of one natural resource and in enhancing the value of another. Goddard’s idea of using revenue from activities that deplete or have an impact on non-renewable natural resources to reinvest in conservation infrastructure has had far-reaching policy impacts. He was well known on the national scene having chaired a committee at the 1965 White House Conference on Natural Beauty. His concept of capturing revenue in the Pennsylvania’s Oil and Gas Lease fund is widely credited as the model for the federal government’s Land and Water Conservation Fund. First passed in 1964, the act was later amended in 1971 to dedicate revenues from off shore oil drilling to open space conservation and recreational purposes. Parks, open space, conservation, preservation and resource stewardship are not politically loaded concepts, unless we let them become so. Their value – in dollars, in health, in beauty and in history – cuts across all political and social lines. Maurice Goddard showed us how our state government – without additional taxes, without taking from Peter to pay Paul, and without rancor, can effectively promote economy and environment. 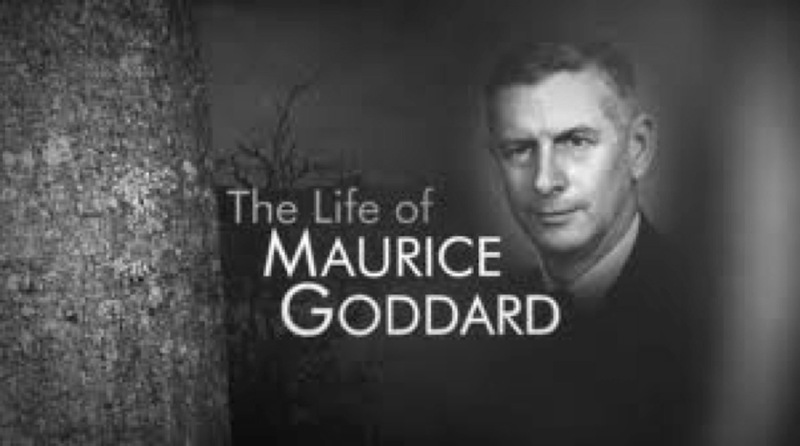 So tomorrow, as we commemorate Maurice Goddard’s one-hundredth birthday, let’s learn from the lessons of history and rededicate these dollars to their intended purpose. If our elected officials across the nation will take a bold step and pick up the torch of conservation leadership, they too may be honored and celebrated by future generations. 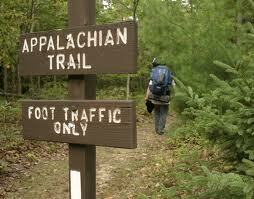 For many of us folks on the eastern seaboard the Appalachian Trail (AT) is our National Park. 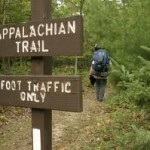 The trail links communities from Maine to Georgia along its 2184 mile length. It is an unparalleled example of a large landscape conservation effort. It is also the National Park Service’s most successful long-term partnership effort. Since 1925 the nonprofit Appalachian Trail Conservancy has managed this resource for the park service raising millions of dollars, harnessing the energy of thousands of volunteers (206,000 volunteers hours in 2011), and partnering with hundreds of landowners. Today the NPS claims that over 99% of the trail is preserved for the benefit of the over 2 million people who use the trail every year and for the generations who will be hitting the trail in years to come. But is it really protected? Every once awhile the social contract that connects this landscape breaks down. Trails are an inherently fragile resource; they are only as strong as the weakest link. So it is important that we react to what is happening along the AT on the Kittatinny Ridge in Pennsylvania. Recently the Appalachian Trail Conservancy found out that Berks County officials were proposing to build a cell tower next to Pulpit Rock an iconic site on the AT. The conservancy contacted the local government owner, Hamburg Borough. 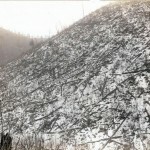 Since the property had been deeded to the borough with provisions to protect the AT, the conservancy hoped the issue could be quickly resolved. This did not happen. Berks County insisted on moving forward with the tower and the matter ended up in county court. Not wanting to wait even for even a judicial resolution, the county recently filed an eminent domain action to take the property owned by Hamburg Borough for the purpose of extinguishing the deed restriction that protects the trail. This act places the whole structure of the AT at risk. The great thing about the conservancy is its partnership approach to land conservation. The organization saves us all money by caring for the trail with volunteers from 30 trail organizations and by preserving the trail on public land through easements and deed restrictions. Because of their work, the federal government has not had to purchase of every foot of the trail. Everyone including the National Park Service had thought the trail in Berks County was protected. While most of the AT is owned in fee, easements or similar deed restrictions have been considered adequate protection. However, if local government partners can erase the deed restrictions on this property, it will send shock waves through the length of the trail. It calls into question a cooperative strategy that has worked for decades. 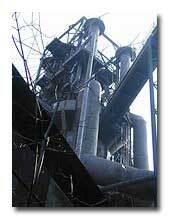 Hopefully, the Berks County Commissioners will rethink condemning one of our national treasures and seek alternative locations for their tower. Summer is the time to plan for the upcoming conference season. Until recently there have been limited opportunities for folks on the ground to learn and share their best ideas on the large landscapes movement. However, this fall has produced a good crop of chances to get together. On the east coast, the Pennsylvania Department of Conservation and Natural Resources is hosting the Conservation Landscape Summit: Naturally Connecting People and Places October 29-30, 2012 in Harrisburg PA. This gathering will include elected officials, local organizations, and business owners who are working in seven conservation landscapes across the commonwealth to use natural assets for conservation and economic revitalization efforts. Meanwhile for those on the west coast, the National Trust for Historic Preservation is holdings its annual conference for the first time in Spokane, Washington. On Friday November 1, 2012, there will be two sessions of interest. The Indigenous Cultural Landscapes: New Ideas on Place will look at defining larger landscapes from the perspectives and lifestyles of pre-Colonial Native peoples. A second session, Conservation on a Grand Scale: Large Landscape Approach, will provide an opportunity for the cultural community to shape the new landscape movement and develop working partnerships with environmental organizations. The speakers at both sessions are leaders in this new field and welcome your questions and participation. This is all part of a trend to adapt the large landscape movement to encompass community sustainability and cultural heritage. Oh, one more reminder from the Living Landscape Observer. If you are interested in cultural landscapes at a global scale consider attending the October 12-13 Cultural Landscapes Challenges in the 21st Century, Rutgers University, NJ . Celebrating the 40th anniversary of the World Heritage Convention and the 10th anniversary of the Declaration on Cultural Landscapes, the conference will bring together scholars and professionals from around the world.